A Glitter that is Real GOLD!! 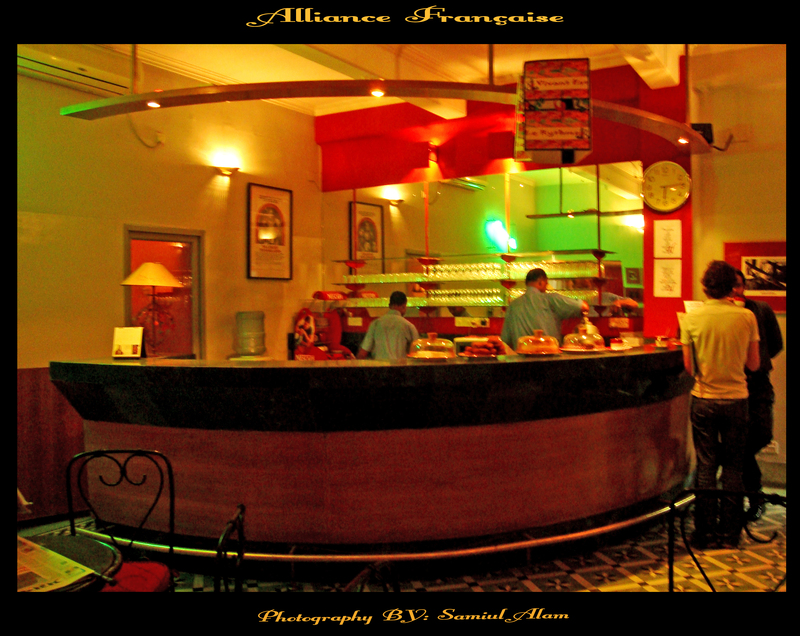 Yes, Alliance Française, my May Queen, gave me a disclosure in the first day I met her… still love that experience… when I was crossing the out-world through her door and looking to the sky, I saw the light was one step behind to melt in the dark when the birds were getting back to their home… while walking, suddenly looked left as my eyes were caught by so many rich-blended colors… Stopped for a while… got a little bit closer… saw so many vectors, faces, insignias and different sizes of art-words… got it now!! 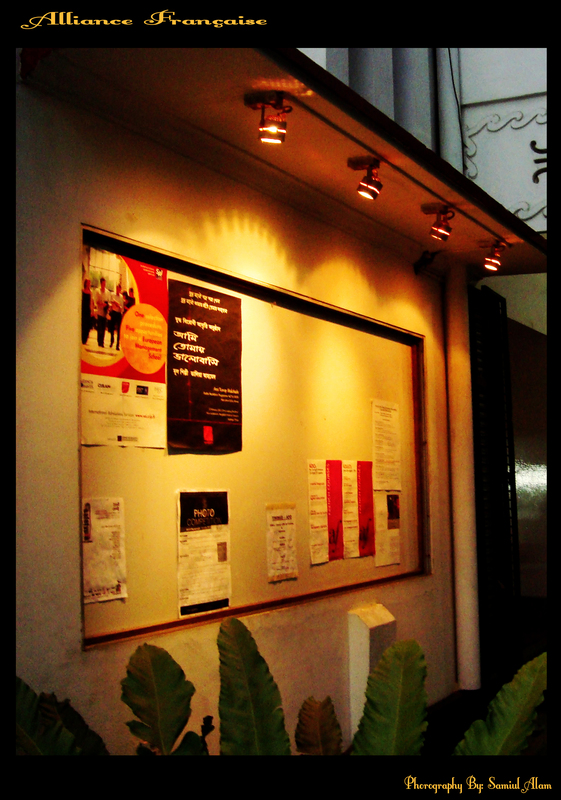 It was the notice board where so many advertisements and notices were pined and most of them were in French. My first feeling was WOW and second feeling was Never seen a confusing notice board like this. It was looking like a craft that I went closer then got it!! The previous line was the feeling of that time, but it was actually an art, because she gifted her children such belief to make things look like this. Is that because he belongs to Alliance ?? I just pushed the door of café and the strange thing is, it was an ocean of colorful illumination where the lights and darkness were playing hide and seek. When I entered, I felt I’m a traveler of both time and space. My legs were walking such a way as I don’t have any control over it. And my eye-balls were moving so quickly to cover all the beauties as far as possible. There were so many photographs on the wall and they were so alive that I was feeling that I’m exploring the whole world in those valuable minutes. The pillars were painted with a thematic drawing of small fishes and horses. Those artistic chairs, round glass tables, even the left red shaded white cups on that table; it was something like HOW MUCH YOU TRY MY FRIEND, YOU CAN’T FIND ANYTING THERE THAT DOEST CONTAIN AN ART. Even the persons who were sitting there, colors were also soothing through there eyes, faces. I took a coffee and while looking at them, my eyes went to a mirror where I found my face. You know what, I found those colors were reflecting through my eyes, face. Yes, I didn’t know when she put those unknown colors in my black and white soul. Feeling on that time was, someone is taking my everything without informing me, refining it and again putting it on it’s place. I sat very calmly and stated to glance. Suddenly my eyes went to a door… outside of the door, it was bright light and yah, its day over there… but how is it possible?? Cause when I came, it was evening, I took my cell phone and saw the time, yah it’s 6:52 pm, How is it possible?? 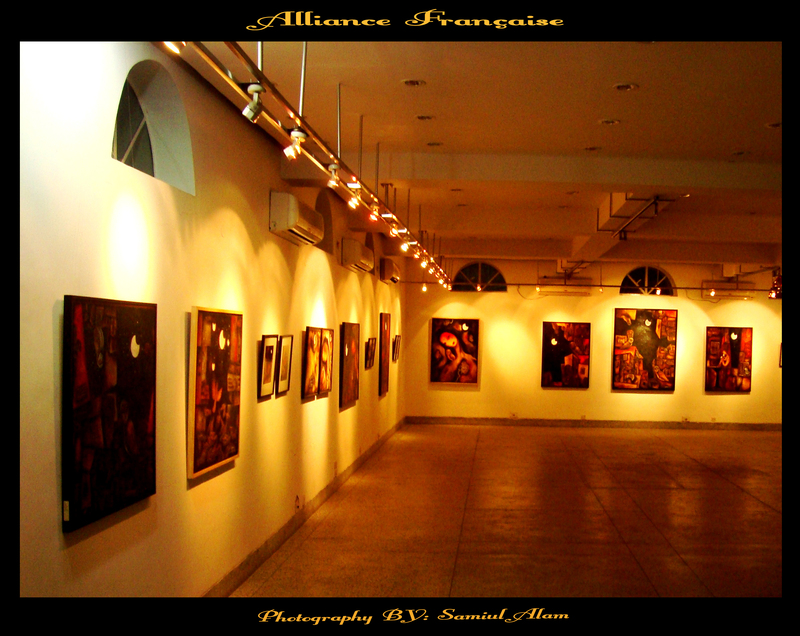 Just left the coffee there and went to discover very eagerly… just before 4-5 second of entering the door I realized Alliance made me fool again… it was the exhibition hall full of eminence … WHAT SHOULD I FEEL NOW?? Bothered? ?- That I didn’t finish seeing the café properly?? Surprised? ?- That the exhibition hall is so much live?? Deceived? ?- That she made me fool again??? By mixing all the feelings I was WONDERED that always I like to be… there was an exhibition was going on of oil paintings. I was alone there. I couldn’t hold myself to explore the artworks…they were so much……. What??? All the arts were started to pierce through all of my sense organs, I don’t know… may be I was hypnotized, I was hearing some footstep sounds, the melody was changing its dimension as I am waling one to another, sometime it was sounding like water bubbles, sometime night-waves and sometime falling leaves. It was the fantasy of those paintings operating my unconscious senses. “Wondering and wonderings, what place to rest the search? And that was the tale of 1st meet of me & my may Queen!